New York movers understand that moving and eviction can spark many emotions for both tenants and property owners. It can be stressful, overwhelming, and frustrating. However, hiring a reputable, experienced, and reliable New York moving company can help ease your worries and make eviction and moving that much easier. 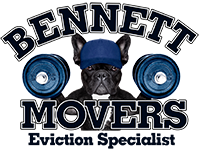 The Bennett Movers team have over 25 years of experience, and are fully licensed, insured, and equipped to deal with New York eviction. The eviction process in New York can be challenging because it involves a great deal of paperwork that can drown individuals for months. As a New York moving company, Bennett Movers can help by providing customers with the necessary documentation and paperwork required by the court, banks, tenants or even the local police department to ensure the eviction process is as smooth as possible. Our company is fully aware of all the legal requirements and sheriff's policies needed for moving evictions. We use only the best packing materials to ensure damage-free delivery of possessions. Moving is our specialty, whether it's property removal or moving into a new home. Regardless of whether customers are individual landlords or a large property management company, Bennett Movers are your go-to for eviction help in New York. Bennett Movers also specialize in working with commercial property owners, real estate, and bank-owned properties. Whether customers need eviction help in New York for small apartments, commercial properties, or full-size family homes, Bennett Movers are the team of eviction specialists and moving crew that you need. The eviction process in New York can be lengthy and overwhelming. Most landlords or property management companies that are forced to evict tenants are often dealing with financial constraints. Not only do Bennett Movers go above and beyond to help navigate the eviction process in New York, they also don’t require upfront deposits! Get help from only the best New York Movers in town! Looking for eviction help in New York? Bennett Movers are the professional and experienced New York moving company you need. Call our team today to learn more and get a free quote. We are FULLY LICENSED AND INSURED, and guarantee that you’ll be more than happy with our professional moving services.